How do you spell relief? Depending on your situation it could mean anything. I was thinking about that old commercial, “Plop, plop, fizz, fizz, oh what a relief it is…” for Alka Seltzer back in the 60’s. (http://www.youtube.com/watch?v=bxjb2UJZ-5I) Often our problems are far from an upset stomach! Relief could come in the form of getting a grade back and finding out that you passed a test. It could be hearing your child’s car pull into the driveway or walking into an air-conditioned home after coming inside from the heat and humidity. Possibly it’s opening a bill and finding out it’s not as high as originally anticipated. It’s almost like you’re holding your breath and don’t realize it until the relief comes and then you can exhale and breathe again. I realize that for myself, when relief comes in any form, I automatically associate it with thankfulness. I don’t tend to take things for granted. In fact I’m not sure what I take for granted if anything. When I find relief, I see it as being blessed knowing that the results could have been different, and give thanks to God knowing that He is always in control. Having had cancer once, I think most survivors always wonder if it will happen again. I don’t dwell on it or spend a lot of time thinking about it. I am trying to eat healthier, exercise more and do what I can to prevent it but every once in a while that thought does creep in and I think that’s normal. I was overdue to have medical tests done due to insurance. Fortunately after many phone calls and paperwork I was able to get funded to have the follow-up tests done. I know that was nothing short of God’s doing. Last month I went and had a diagnostic mammogram and a breast MRI done to make sure that nothing abnormal was going on. You want the tests done but at the same time you don’t because you don’t want to hear that there is a problem. The wait seems forever but once you get the results and hear that all things are NORMAL, there is RELIEF! And along with the relief, is THANKFULNESS to God! I can exhale now! When God created man, He did so by breathing life into Him. “Then the Lord God formed a man from the dust of the ground and breathed into his nostrils the breath of life, and the man became a living being.” (Genesis 2:7) When we find relief and can start breathing again, I think it’s appropriate to be thankful to the One who not only gave us life but also the cause for relief. I would like to invite you all to my newest blog, New Wine for New Wineskins here at WordPress and sign up to follow it. Each “chalk chat” or post on my chalkboard will be a devotional, many relating to current events. Perhaps it will be something you will be able to use as a tool in sharing with a friend or co-worker, as well as hopefully strengthening and refreshing your own soul! I hope you’ll choose to join me on my new journey. Wineskins were made from clean animal hides and used for storing and carrying wine. As new wine continues to ferment, the carbon dioxide produced causes the wineskin to expand. An old wineskin would already be stretched with no room for expansion and thus be unable to hold new wine. I feel this verse sums up the point I’m at right now, bursting with a love for God’s Word and the revelation He gives and I want to share it with you my readers! I make no apologies. It’s been awhile since I posted in this blog. 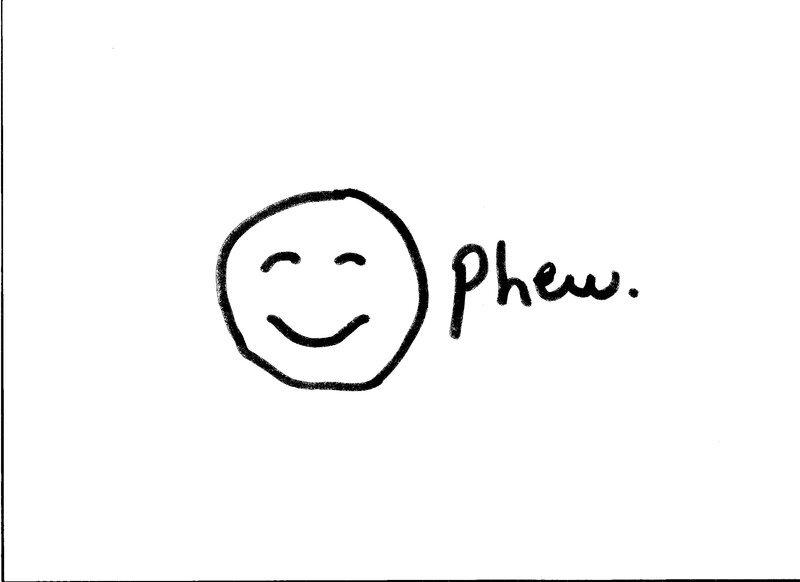 The good news is life is back to “normal” in the sense that I am not undergoing any treatment for cancer. I am feeling pretty much recovered from all the side effects. There’s still some aches and pains and sensations but at this point I honestly don’t know if it’s still from treatment or if it’s from aging, LOL. The joke among my “cancer friends” is that we can blame most any symptom we are feeling as a lingering side effect from chemo! Here we are at the start of 2014. A new year. A clean slate. Another fresh start. It’s probably a blessing that we don’t know ahead of time what the year may bring. One thing I learned through this whole journey is not to worry about what may or may not happen but to take one day at a time and to enjoy life to its fullest. (Matt.6:27) Whatever comes my way, I am confident that God will give me the strength I need and will not leave me to walk alone. (Deut. 31:6) He has brought me through some very tough days. The road ahead may include some steep inclines, rough terrain, deep valleys, curvy and winding roads, an occasional bump in the road, and detours but my GPS (God Perspective System) will keep me focused knowing that He has my best interest in mind. We won’t always understand the course He has us on but we can be assured of where we’ll end up ultimately. 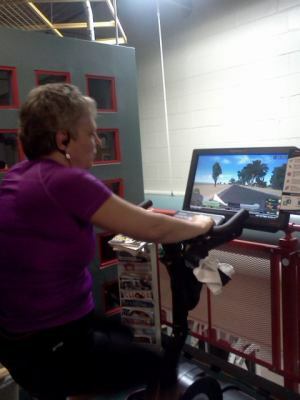 I enjoyed the bike the most for cardio…actually steered on the courses selected! New Year’s is a popular time to make resolutions on changes we want to make in our life as we reflect on how we did the previous year. Some things are out of our control but many are not. We have a choice on how we’ll travel our journey through the year. Probably some of the most popular resolutions are health related…exercise, lose weight, eat healthier, get more rest, etc. Most of these are broken within a month and then people just give up completely. I wish more people looked internally to make changes…attitude adjustments and heart issues…than just externally. My graduating class…12 weeks of sweat and tears. I think the success of a resolution boils down to desire, motivation, discipline, and wisdom. You have to really want to reach a goal bad enough in order to do something about it. There has to be reason to reach it. You have to have an obtainable plan to get there and it has to be plan that if followed will indeed get you there. 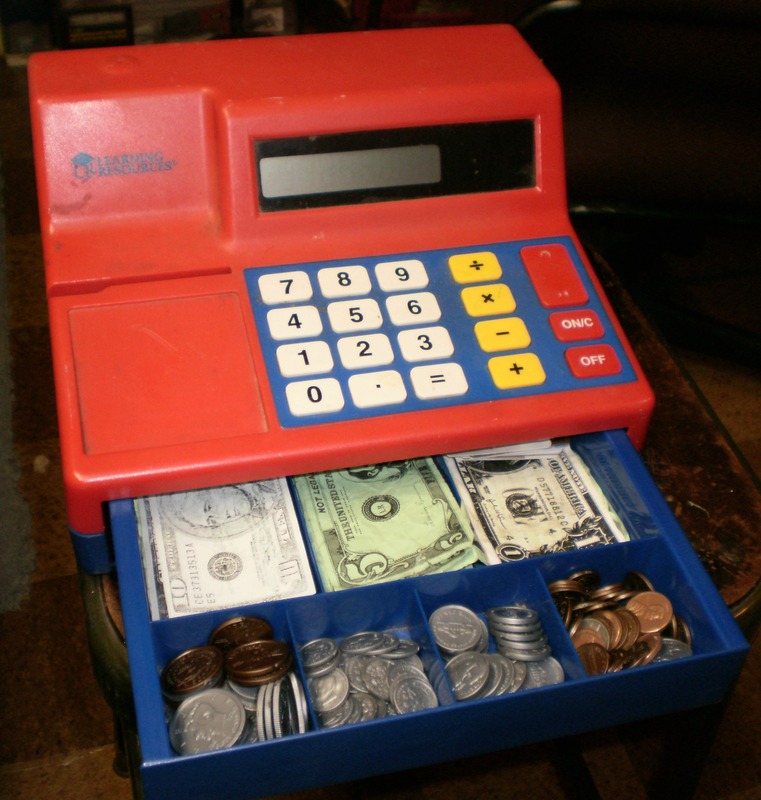 As a child I enjoyed playing “store.” When I was teaching my own children, we used a play cash register and they learned how to make change. We would set up toys and other items and put price tags on them. They would “shop” and purchase items or be the cashier, but either way they had to learn how to count money and make change. It was a process and took time to learn. Do you really want to make change in some areas? Then do something about it. I know for myself that last year I set a goal to run in a 5K and to start getting myself back in shape physically after going through cancer treatment. 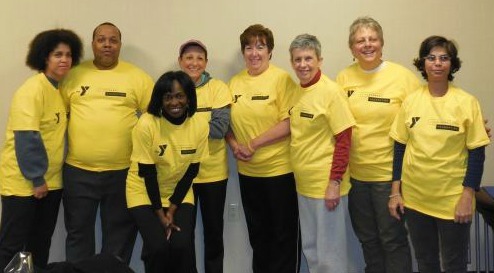 I did run the 5 K in September and then I also signed up for the Livestrong program at the YMCA. It is a free 12 week program for cancer survivors that encompasses cardio, strength, and flexibility. It was a big commitment. I had never even been in a gym before. Not only did I learn a lot and get healthy and fit but I met a great group of people as well. Now at the start of the new year I am ready to take on the challenge of trying to maintain my fitness. I am still not sure whether I will join a gym or do it on my own at home but I am determined to follow through. I feel better than I have in a long time. Whatever my journey this year encompasses, I am determined to go through it feeling my best, not only physically but emotionally and spiritually as well. “Exercise daily in God—no spiritual flabbiness, please! Workouts in the gymnasium are useful, but a disciplined life in God is far more so, making you fit both today and forever.” (1 Tim.4:8 MSG) Change is hard but if we stick with it and really want it, with God’s help we can achieve it. Here’s to the best in 2014. It’s been awhile since I have posted on my blog. Thankfully I am done with all my cancer treatment at this time. A year ago I had finished my chemo and was in the middle of radiation when I felt like I needed to start doing something about getting my body back in shape. I felt weak and stiff and was 20 pounds heavier from the steroids. I felt like I was walking around in a fog from chemo brain during the Fall. By January I was starting to feel a little better. I went on diet and lost about half of the weight I had gained during treatment but still hadn’t started any kind of exercise regime. If you recall, I was determined to do what I could to start exercising and still hadn’t really done anything. When this summer came I knew I had run out of excuses and so I started running…literally. Last September I was aware of a 5K in my town and had set a goal in my head to run in it the following year when I was finished with all my treatment. Am I a runner? Let’s just say that I hadn’t jogged since college. We’re talking over 30 years here. I put an app on my ipod called C25K (couch to 5K). This aptly describes where I was coming from and the direction where I was trying to head to. It’s a 9 week program that has you train for 30 minutes/ 3 times a week. I figured that was easy enough. It didn’t go according to distance but by time spent training. Day one starts you out jogging for 90 seconds at a time and walking in between. It sounded easy enough until I started training. That first 90 seconds seemed like 90 minutes! I kept looking at my watch thinking the app was broken or wasn’t working. I kept waiting for the voice to say, “Walk.” It was not easy but I was determined to do this. How long is a 5K? It’s 3.1 miles or it would be like “running across a football field 54.68 times, running around all four bases of a regulation baseball diamond 45.47 times, running the length of an NBA-regulation basketball court 174.12 times or running a little less than 1/4 the length of Manhattan.” As I built up endurance I mapped out a course from my house that increased as the weeks went by. I kept with the program all summer, running mostly in the early morning before it got too warm out (or before too many people saw me). I only had one fall. It was a face plant where I landed on both of my palms in August and my hands are still peeling as they heal. It was on days like that that I questioned myself wondering if I was crazy for starting this in the first place. I also scraped a shin one time rounding a corner too snugly where there’s a low brick wall. Other than that I survived and hopefully didn’t look too ridiculous although one of my son’s friends saw me running when he was stopped in traffic and mentioned it to him. By the seventh week I was able to jog for 30 minutes but then I started back to work. I wasn’t able to fit in running before work and I was hot and tired at the end of the day. I tried running then but it was too laborious. My training was limited mostly to the weekends. I paid and signed up for the 5K knowing that if I didn’t commit I might back out. A portion of the proceeds were going to help victims from Hurricane Sandy at the Jersey shore. The race was the day after I completed the C25K app. Initially my goal was to run the entire race but I realized I would not be able to. Rather than getting discouraged I changed my goal to simply completing the 5K but I wanted to do it in under 40 minutes. I wasn’t really sure what to expect at the event. I went to the race way too early. I had to pee and then the only bathrooms they had were quite a distance away. There was probably about 240 racers there and they had some children’s races first. The start of the race reminded me of a herd of cattle initially and was a little difficult with bodies everywhere but pretty soon it starts to spread out. Some move way out ahead of the pack and others trail behind. I was somewhere in the middle, passing some and others passing me. Probably more of the latter. I was afraid that I might not know where to go but the course was clearly marked and crossing guards and police were at intersections stopping any traffic. I could usually see someone ahead of me to follow as well. Unfortunately part of the course was going up streets on an incline. I chose to briskly walk those parts of the course, taking a breather then. 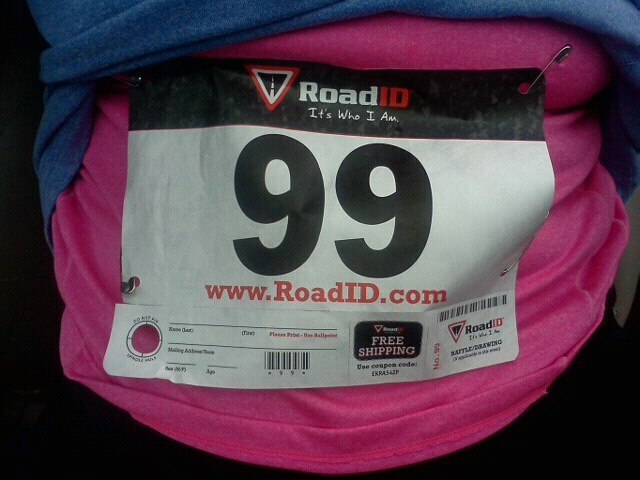 My bib! They have some kind of timing chip in them to record our times. Hebrews 12:1 says, “Therefore, since we are surrounded by such a huge crowd of witnesses to the life of faith, let us strip off every weight that slows us down, especially the sin that so easily trips us up. 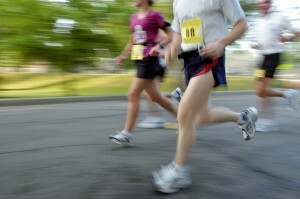 And let us run with endurance the race God has set before us.” (NLT). While training for this 5K this verse came to mind often. I learned very quick that even a sweatshirt was too burdensome to have with me if I wasn’t wearing it. Any weight, any excess was a burden and would slow me down. Days when I was having trouble with my ipod or earbuds and was preoccupied with them would slow me down. An uneven sidewalk tripped me up that one time and my injury was bothersome for quite some time. It took a lot of endurance (or some translations read perseverance) to train and run the race. It wasn’t always easy; wasn’t always ideal circumstances, but I had to keep at it in order to reach my goal. There were witnesses not only at the finish line but along the race course as well, watching and cheering us on. In The Message, Hebrews 12:2-3 says, “Keep your eyes on Jesus, who both began and finished this race we’re in. Study how he did it. Because he never lost sight of where he was headed—that exhilarating finish in and with God—he could put up with anything along the way: Cross, shame, whatever. And now he’s there, in the place of honor, right alongside God. When you find yourselves flagging in your faith, go over that story again, item by item, that long litany of hostility he plowed through. That will shoot adrenaline into your souls.” We are all runners in this race of life, in our walks of faith. Even in training I had my eyes set on goals along the way…just make it to that tree, the next intersection, to the park, to the cul-de-sac, etc. There will be distractions, things to slow you down or trip you up, hurdles to get over. The good news is that Christ has gone on before us. He’s waiting at the finish line for us! He’s cheering us along on the way! He’s showed us how it is to be done and given us what we need to make it there! He’s marked the course for us. Read your training manual (Bible) and follow it! Don’t be lazy. Hang in there. Get moving and I’ll see you at the finish line. Since I was diagnosed and began treatment for cancer, I have wanted to participate in some kind of walk or event to help raise money for cancer research and other services that organizations provide to cancer patients. I was not physically up to it while going through treatment but had the privilege and availability last week to finally do one. 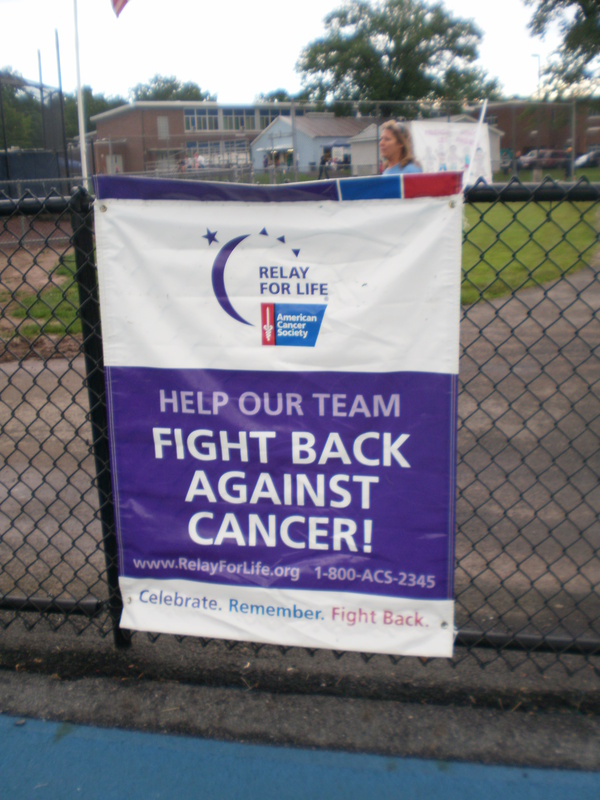 I hesitantly signed up to do Relay for Life by the American Cancer Society. I say hesitantly because when I went to thewebsite and read what it was all about I saw that participants “camp out” and stay overnight. I never even did many “all-nighters” when I was in college yet alone one outside at this stage of life! I emailed the person in charge asking if I HAD to do that and found out I could just attend whatever events I wanted to. With only two weeks to go before the Relay I emailed and posted the event and was able to raise $450 for the American Cancer Society! Many of you were supporters, thank you! In total 37 teams and 973 participants helped raise $140,870.82 (latest figure) at the one I attended. 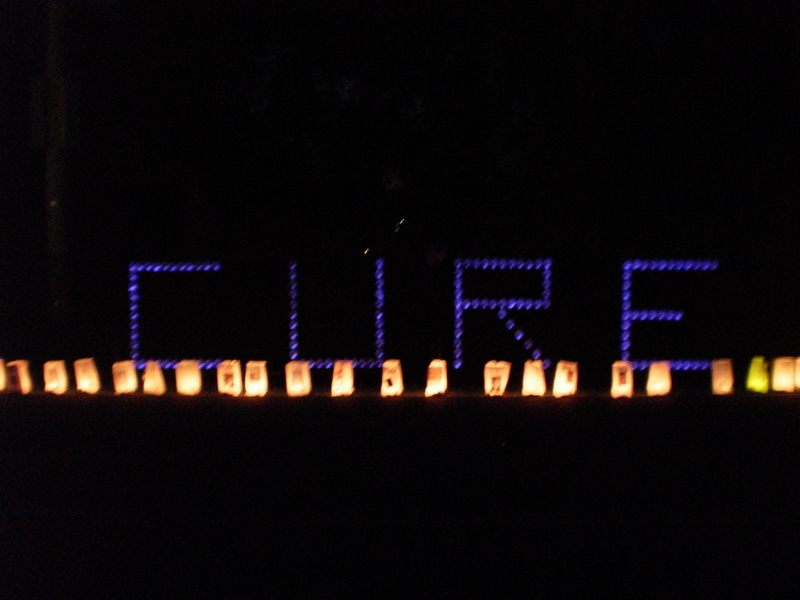 Many communities do a Relay for Life and they happen around this time of year, I think all at high school tracks. 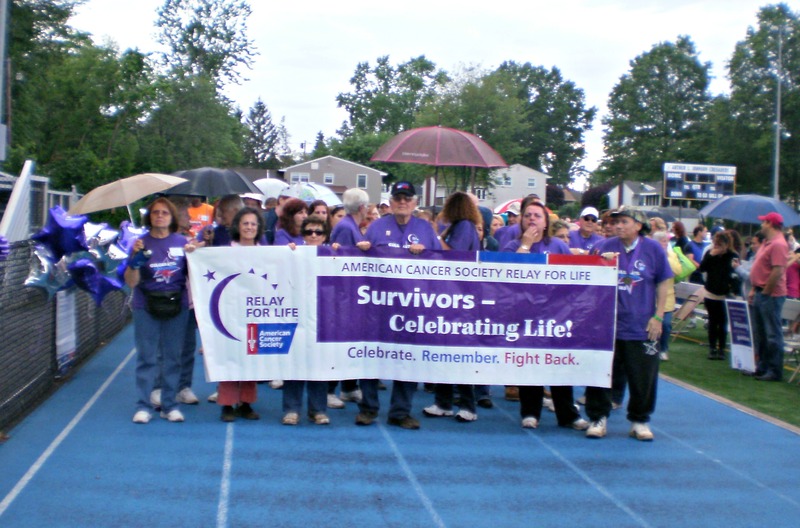 More than 4 million people in over 20 countries participate in a Relay. Let me tell you first what the funds raised help do. 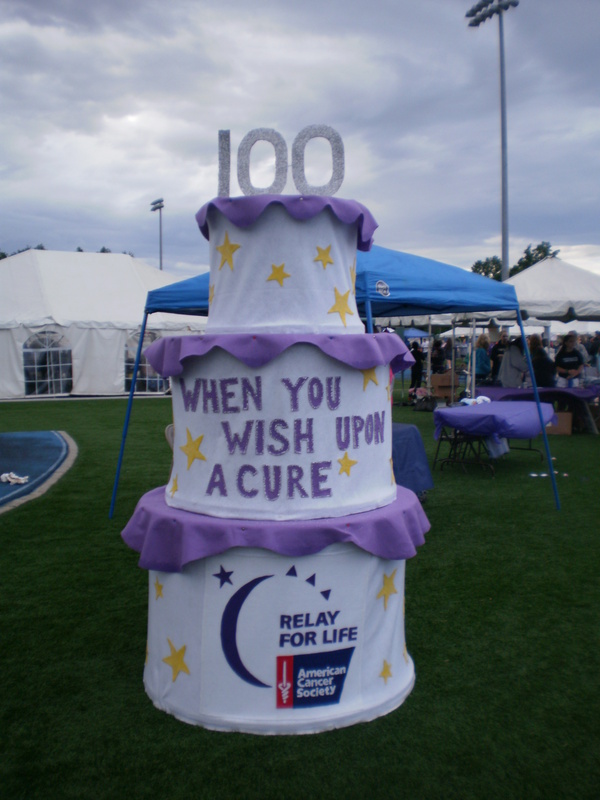 The American Cancer Society is celebrating it’s 100th birthday! No single nongovernmental, not-for-profit organization in the US has invested more to find the causes and cures of cancer than the American Cancer Society. Since 1946 they have helped make possible almost every major cancer research breakthrough. They provide a place to stay in one of the 31 Hope Lodge facilities for cancer patients and their caregivers while receiving effective treatment far from home. They provide transportation for cancer patients to and from treatment for those that do not have a way to get there or are unable to drive themselves. 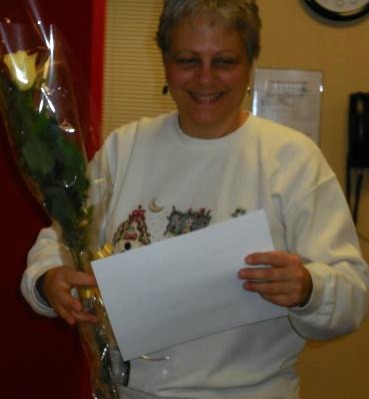 The ACS has a program to help cancer patients look good and feel better about themselves. I attended one of these and you can read of my experience. They also have a support program matching specially trained breast cancer survivors with those who are newly diagnosed that need someone to talk to. The Relay runs from 6 pm to 6 am. The opening ceremony included speeches, songs, and the release of about a dozen doves. Then the State Troopers bagpipe band led a procession of cancer survivors around the track for the first lap, a victory lap! There were 208 survivors registered but less were there I believe due to the weather. The event is held rain or shine and storms were threatening. As we walked around the track, caretakers, family and friends cheered us on. 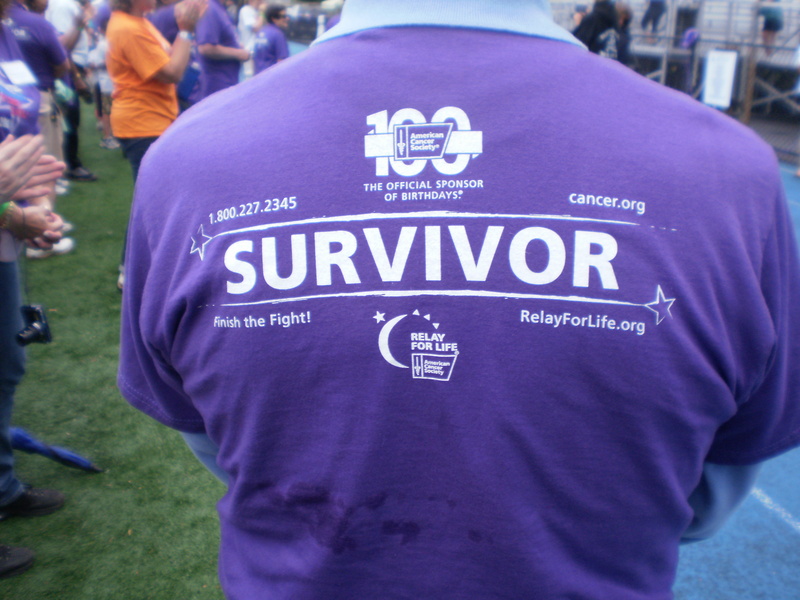 It reminded me of Hebrews 12:1, “Therefore, since we are surrounded by so great a cloud of witnesses, let us also lay aside every weight and the sin that clings so closely, and let us run with perseverance the race that is set before us.” (NRSV) There was a sea of purple as we wore our Relay survivor shirts. Each participant had their own unique circumstances, yet we were united in spirit sharing the same unfortunate struggle…CANCER…but as survivors! On the second lap around, the caretakers joined us. This was CELEBRATE! Personalized luminarias lined the track. We need to make investments in things we feel are worthwhile. For me this will be one of them. I hope my small part will add more birthdays to someone’s life. At what point do you give up? I guess that would depend on how bad you wanted something or how important it was to you. After my car was junked and we had to find a cheap replacement quickly, we acquired a vehicle that was mechanically sound enough to get me to work and back. My husband had taken it for a test drive and came home with my “new” car. As my son and I took it out for a spin I climbed in only to plant my feet on a sopping wet mat. My husband deduced that the previous owner must have left a window open. We aired out the rugs and started fresh. Enter the first day of rain. Floor mats are once again soaked. At the first opportunity we spent several hours with buckets of water and then a hose trying to see where the water was coming in from. It was impossible to find the source so we covered the car with a tarp the next few times it rained. Once again, my husband spent several hours with a friend trying to find the source. No luck. Each time we came up with a different idea…was it the windshield, the door, underneath the car, was rubber rotted on a seal, the hole where the antenna came out of, etc? Finally another friend helped my husband and they discovered that one of the tubes for a drain from my sunroof had become disconnected and the water was running down inside the frame. It was a simple fix but had taken hours to figure out. What if we hadn’t been persistent? It would have been easy to give up. It would have been very aggravating every time it rained if the source had never been found. Now that we found the source of the interior leak, there is still one more to find. I kept hearing a “sloshing” sound. After investigation I realized that after a heavy rain my rear passenger door fills up with water! Fortunately it does not leak INTO my car and I have to remember to drain it after a rainfall. I guess with some more persistence we will be able to solve it. It reminds me of a very persistent widow in Luke 18. Jesus told a story about her to encourage his disciples to pray consistently and to not give up or lose hope. How easily we can give up after praying ONCE about something. 1 Thessalonians 5:17 can be translated as “pray without ceasing,” “never stop praying,” and “pray constantly.” And what is prayer? Simply talking to God, pouring out your heart to Him. It’s not difficult to keep up a conversation. He’s always listening and ready to hear what is on your heart. I love the way The Message translates 1 Thessalonians 5:16-18, “Be cheerful no matter what; pray all the time; thank God no matter what happens. This is the way God wants you who belong to Christ Jesus to live.” It’s an attitude of gratitude that flows from your heart despite your circumstances. If you are a thankful person it’s much easier to continually be communing with God or talking to Him. It’s natural to want to spend time with Him and persistently be in His presence. I am rejoicing. 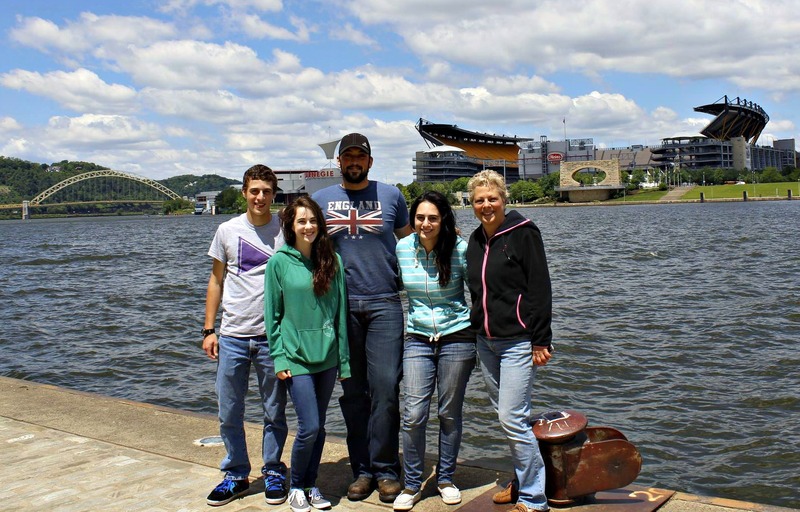 My mechanically sound car got me to Pittsburgh over Memorial Day weekend to visit with my daughter, son-in-law and other relatives. It rained on the way out and the way back and we were safe and dry!